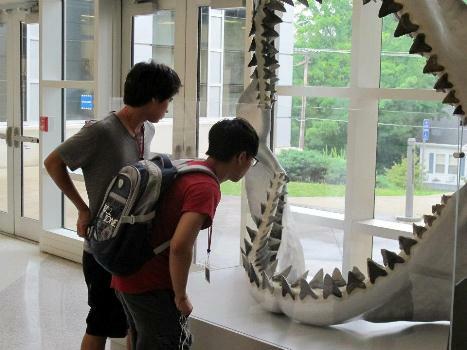 More than 160 of the state’s top high school students studied website design, astronomy, and anatomy among other subjects June 30 – July 27 at the 2013 Governor’s School for Math, Science, and Technology at University of Lynchburg. This is the 18th year University of Lynchburg has hosted the program, which is directed by LC mathematics professor Danny Cline. The school provides intensive, hands-on learning experiences in classes offered by University of Lynchburg faculty and a core of faculty recruited from high schools and colleges. During their month-long stay, students live in College residence halls and enjoy the use of College facilities. They choose one of 10 classes of study. Check the complete course list. Each year since 1973, Governor’s Schools have offered opportunities for high school juniors and seniors from across the state to study together. Every public and private high school in Virginia is invited to submit nominations for students who have been identified as gifted in a particular area. Governor’s schools are also offered at other locations in the humanities, visual and performing arts, and foreign languages. Find more information or contact Dr. Danny Cline at 434.544.8372.